Science makes fact out of fiction, changing our lives through new technologies. But it’s a long road from invention to adoption. Only when a technology becomes affordable and ubiquitous enough can it usually begin to solve some of the world’s most pressing problems. We are approaching this tipping point in biofabrication, the science of using living organisms to build with biology and make everyday products. For the first time, it’s becoming inexpensive enough to unlock the wonders of biology, not just for pharmacological or industrial uses, where we’ve seen tremendous advances in the past few decades, but directly for consumers in a host of different ways. A new era has arrived, one where we can harness biological organisms to create consumer materials that grow themselves. Materials that combine the best of nature and the best of science, while reducing the enormous strain of current production practices on our planet’s finite resources. The first commercial computers were enormous, cost a fortune and calculated at a glacial speed by today’s standards. Yet, they had huge ramifications for customers with mission-critical needs (and deep enough pockets). NASA leveraged early IBM mainframes to vault ahead in the space race and land the first man on the moon. In the decades to come, we watched Moore’s Law hold true: transistors per square inch on integrated circuits continued to double every year-and-a-half, driving down costs and democratizing access to computing power. Today, the basic toolkit of computer science is accessible to just about anyone. Through our smartphones, we all have supercomputers in our pockets, and a billion-dollar idea can be conceived of and coded almost overnight. We are marching down a similar path towards widespread adoption of the biological toolkit and the ramifications could be equally far-reaching. 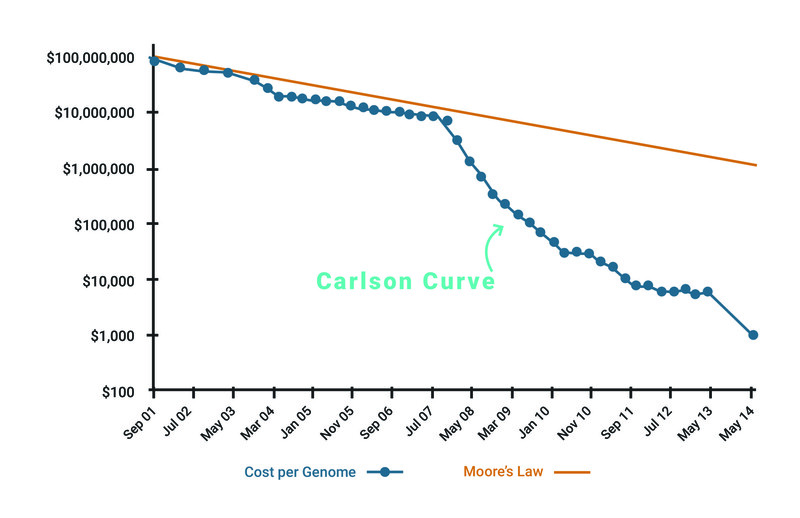 Just as a computer uses binary code of 0s and 1s to process information, the basic building blocks of biotechnology are DNA base pairs — specifically, the ability to read and write them in their code of A, T, G and C.
In the 21st century, the drop in DNA sequencing costs — a trend called the Carlson Curve, named after Dr Rob Carlson — has outpaced even Moore’s Law. As the costs of working with DNA have dropped, the opportunities have soared. 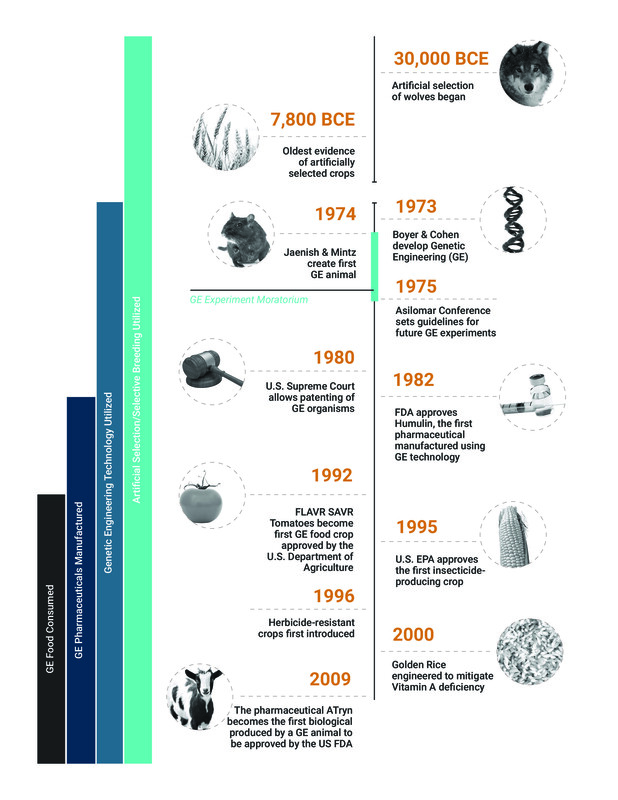 Examples of biotechnology successes are plentiful. After the invention of recombinant DNA in 1973 the technology improved and costs dropped, leading to viable applications in crop production, pharmacology, and diverse industries. Amgen, for example, harnessed recombinant DNA to clone, express and produce drugs starting in the 1980s. Its product Neupogen, a white blood cell boosting drug that helps cancer and HIV patients stave off infections, was approved for medical use in the USA in 1991 and is now on the World Health Organization’s List of Essential Medicines. Various other industrial applications have proliferated, from biodegradable plastics to biofuels. In agriculture, the first genetically modified crop was a tobacco plant modified for antibiotic resistance in 1982. Commercialization of engineered crops began in earnest a decade later when the US Department of Agriculture approved the FLAVR SAVR tomato, which was genetically modified to be more resistant to rot. 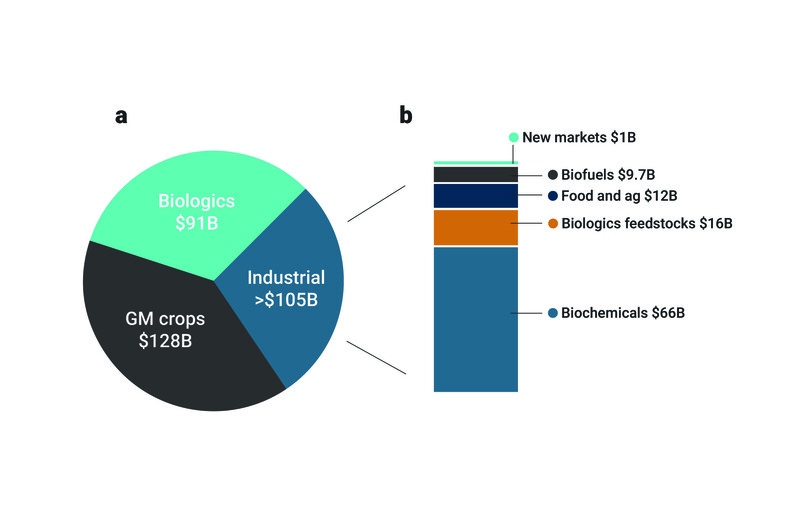 Since then, the surge of engineered crops has been profound: between 1996 and 2015, more than two billion cumulative hectares of biotech crops were cultivated — that’s equivalent to more than twice the total landmass of the United States. All of these specialized applications are so successful they can support huge fixed costs. Perhaps they are biotechnology’s shot at reaching the moon. A life-or-death drug can command a vast R&D budget, while a genetically-modified crop variant can reap rewards indefinitely after large upfront development costs. We stand on the precipice of widespread consumer adoption of biotechnology — a new category unto itself that will grow alongside medical, agricultural and industrial applications. We can now competitively biofabricate everyday materials. Welcome to the era of consumer biotech. This will extend to all sorts of materials grown in a laboratory: plant-based food products engineered to taste like real meat, potentially grown with the same proteins that you would find in the animal; and shoes, neckties, jackets and other wearables made from biofabricated spider silk. We could see living concrete that deploys microorganisms to self-repair cracks that form over time. After fits and starts from biofuel companies striving to create energy-producing algae and microorganisms at massive scale, we have recently seen signs of progress. This personal contact with biotechnology will extend to all sorts of materials grown in a laboratory: plant-based food products engineered to taste like real meat, potentially grown with the same proteins that you would find in the animal; and shoes, neckties, jackets and other wearables made from biofabricated spider silk. We could see living concrete that deploys microorganisms to self-repair cracks that form over time. After fits and starts from biofuel companies striving to create energy-producing algae and microorganisms at massive scale, we have recently seen signs of progress. Will biotechnology provide food security? The next step will be a transition from imitation to pure innovation: materials and products that aren’t just produced in a new way, but exhibit qualities that don’t yet exist in nature at all. These spider silk companies envision materials as soft as silk but more durable. Companies like Impossible Foods are starting with burger taste-alikes, but their loftiest visions involve biofabricating new flavours altogether. Researchers are even working on engineering a plant that changes colour in the presence of explosives. 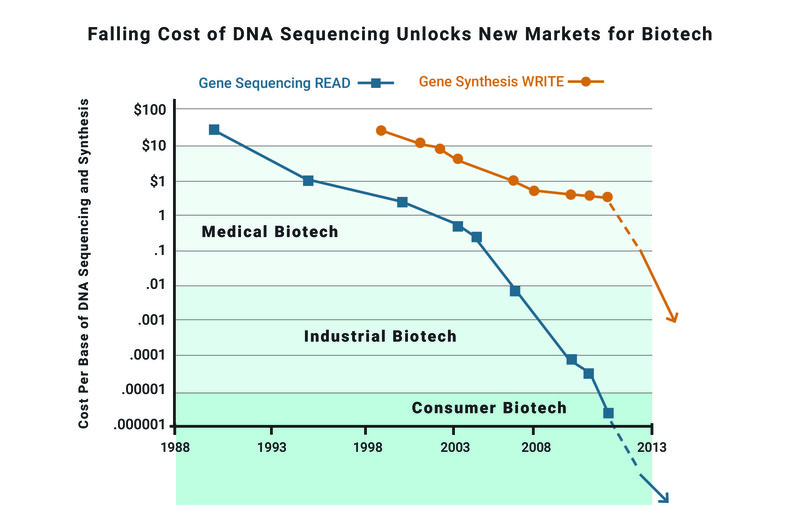 All of this progress in consumer biotech is predicated on the declining costs of working with DNA. In our laboratory, we edit cells’ DNA many times over, screening through thousands of variants to pick the Olympic athletes that exhibit better properties for our materials. Until recently, business strategies like ours, seen throughout the consumer biotech industry, were simply cost-prohibitive. In the decade to come, we will witness the full implications of consumer biotech. A host of new companies will harness the power of nature to create materials in an environmentally sustainable way and without harming animals. In so doing, we will be exploiting the world’s oldest, most accomplished tools – biology and human ingenuity – to develop everyday products that can ignite our imaginations.